Cape Gooseberry, Physalis peruviana, produces a strongly acid fruit,which can be enjoyed raw or cooked. A prolific bearing, low growing vine that produces golden yellow berries. Ideal for small gardens or in a pot on the verandah. 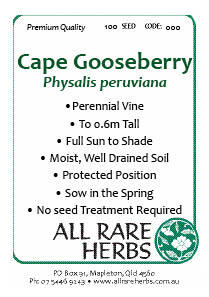 Cape Gooseberry prefers well-drained soils in a protected part- shade to full sun position. A perennial in warm climates and annual in cooler climates. Grows to 0.6m x 0.6m. Be the first to review “Cape Gooseberry, seed” Click here to cancel reply.